Took my talents and appetite to Bar5015 For Sunday Brunch. I was not completely pleased with my dish from last week so as I usually do, I did a repeat to one of my favorite brunch spots. This cute little bar off Almeda ,near the museum district in Houston ,Teaxs. 5015 is a great place to start your Sunday Funday. You will experience a laid back social setting on some Sunday’s , while others ,you just may catch yourself on the dance floor. The Djs are awesome.The bar scene is ideal for a brunch date ,small groups, or a solo Sunday out. (which is typically me). There are 2 patio decks that provide extra seating but due to high demand , seating is generally limited. (I recommend early arrival or RSVP). With the open patio in the front you are able to smoke cigars . (They usually have a cigar vendor ) Bar 5015 staff members are cool, witty, and pretty prompt at getting your order. I have never had any issues with customer service here. If you are wanting a quiet brunch… I would not recommend. I can honestly say the many of times I have had brunch here , I have NEVER been disappointed. Etta’s kitchen provides the food for 5015. The menu is limited to 5-6 items , (good for me because I’m indecisive)but options change weekly keeping it interesting. I love the fact they always throw a twist on the menu. (Which is always good). If you are uncertain , you will never fail with their Shrimp and grits , Belgian waffles or Oxtail fried rice. I absolutely love crab so today was easy “the Crab Quiche please”! (Talk about excited) The flavors and textures blended perfectly well. With the quiche being so savory , The house salad was a great compliment to the dish. (homemade vinegarette w/ almonds over a bed of spinach) I did not leave a crumb on my plate . I left wanting more as the portion size was fair. If you are looking for a more healthy /lighter meal then the crab quiche is a great option. (Men I suggest adding meat or waffle to this order). Did I mention the drinks are poppin here too! 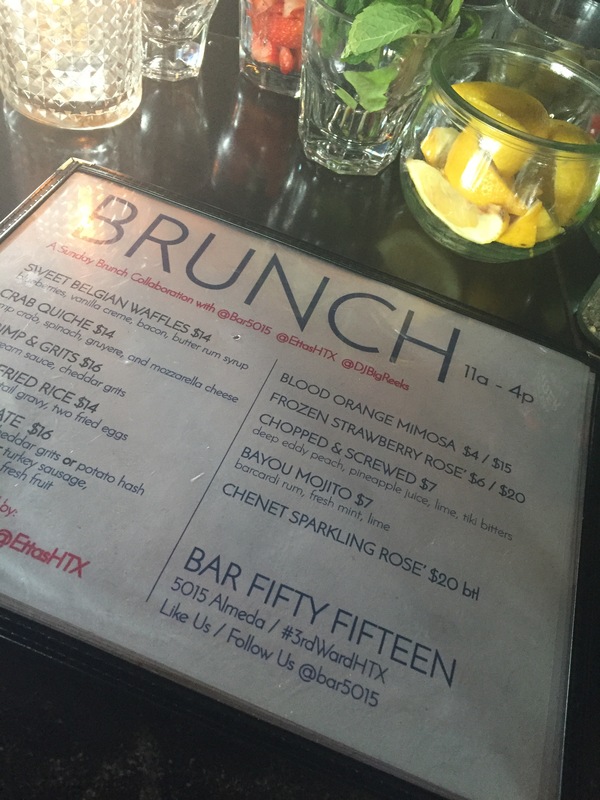 To see what else is happening at bar 5015 during the week be sure to Follow them on IG and Etta’s.